Thanks to your support, we did it! The National Trust is proud to announce the creation of the Birmingham Civil Rights National Monument in Birmingham, Alabama. Over the next few months, the National Trust will continue working with City of Birmingham to develop and adopt an economically sustainable reuse plan and tax credit project at the A.G. Gaston to help preserve its civil rights legacy and to help revitalize the surrounding area. Today, President Obama also designated Freedom Riders National Monument in Anniston, Alabama, which honors the legacy of activists who boarded buses at the site in a challenge to segregation, and Reconstruction Era National Monument on St. Helena Island, South Carolina, which originally functioned as an educational institution for formerly enslaved people following emancipation. Join us in thanking President Obama for honoring these important pieces of history! 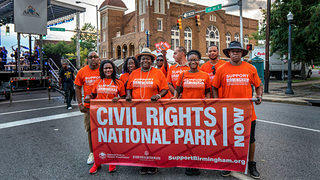 Just a little over a week after The New York Times published a fascinating article about the importance of the history of the civil rights movement due to recent events in America, the National Park Service and U.S. Representative Terri Sewell (D-Alabama) will be hosting a public meeting about the creation of a new Civil Rights National Park in Birmingham. The hearing will take place Thursday, October 27 at 5:30 pm CST (doors open at 4:30 pm) at the historic 16th Street Baptist Church at 1530 6th Avenue North. In addition to Rep. Sewell, U.S. Secretary of the Interior Sally Jewell and National Park Service Director John Jarvis will be in attendance to discuss potential recognition of the "critical places and events in the city as a turning point in American history." 16th Street Baptist Church, target of September 1963 bombing that killed four young girls during a Bible study. 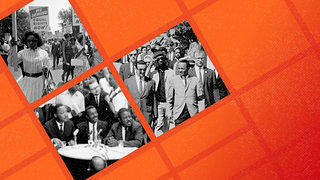 This act of domestic terrorism became a galvanizing force for the passage of the Civil Rights Act of 1964. A.G. Gaston Motel, built in 1954 and owned by a prominent black businessman, served as home base for the Southern Christian Leadership Conference and "Project C" (C for confrontation). The National Trust for Historic Preservation named it to its portfolio of National Treasures almost a year ago.- Kelly Ingram Park, where protesters were violently disrupted by police dogs and powerful water cannons. Images of the brutal police response to peaceful protesters spread across the country, shocking the conscience of the nation and the world. We encourage those who are able to attend Thursday's event to do so in support of the designation, but you can also sign our petition here if you can't make it. On the 53rd anniversary of the bombing of the 16th Street Baptist Church in Birmingham people gathered to remember the four young girls who perished on that terrible day. Mayor William Bell wants people to always remember the role that Birmingham played -- both tragic and inspirational -- in the Civil Rights Movement and began working with Congresswoman Terri Sewell, and soon after the National Trust, to make it happen. During yesterday's "All Things Considered" program on NPR, WBHM reporter Andrew Yeager told the story of our collective quest for a Civil Rights National Historical Park in the city while interviewing officials like Bell alongside locals who agree that recognition is long overdue. In fact, during his lunch at a local restaurant, resident Ronald Williams told Yeager, "Yes. It should have been done years and years ago." You can help the process along by adding your voice to the thousands who have already signed our Change.org petition asking Congress and President Obama to recognize the historic district. We hope that federal action will take place within the coming months.